Sure the bacon and brisket burger sounds good, but wouldn’t it be extra enticing if you could see the char marks and the fluffy bun before ordering? Snapchat thinks so. 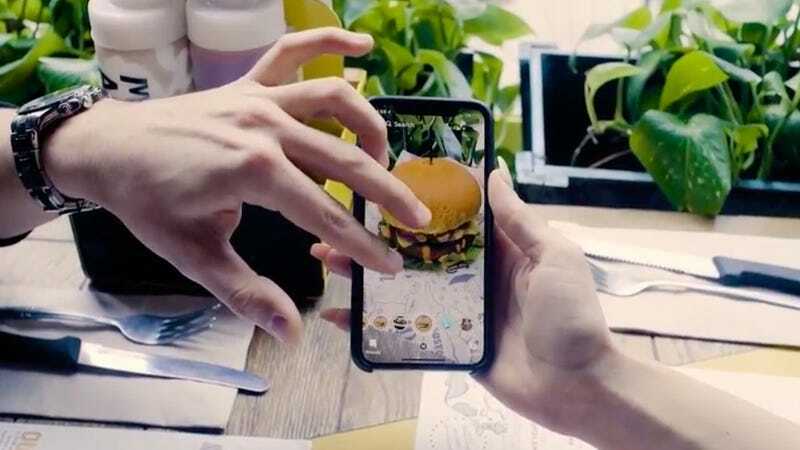 The social media app is working with tech startup Kabaq, Digital Trends reports, to create “augmented-reality menus,” starting with burger chain Bareburger. Kabaq and Bareburger are promoting their partnership via the above video, which is one minute and 30 seconds of the most annoying millennial couple you’ve ever witnessed. They’re both on their phones. They’re posing with invisible, virtual burgers. (If I had to watch this couple IRL I might ask to be reseated.) If you can get past these terrible millennials, the technology does seem cool! In the pilot phase, Bareburger’s partnership with Snapchat offers 5,000 Snapcodes that allow users to explore the augmented-reality menu. The digital burgers can also be mixed with other Snapchat filters, photographed, and posted to a user’s Snapchat like any other image. Anyone can use the code to test out the AR menu, but the 5,000 physical tickets given away at the restaurant are redeemable for free burgers. Presumably, real ones. Ask The Salty Waitress: Do servers treat me differently when I&apos;m using a coupon?